Epson TM-J7100 - Inkjet, two-color, receipt & slip printing, 17 lps, USB-No Hub Interface, DM, MICR/SmartPass and auto-cutter. Requires Power supply. Color: Dark gray. 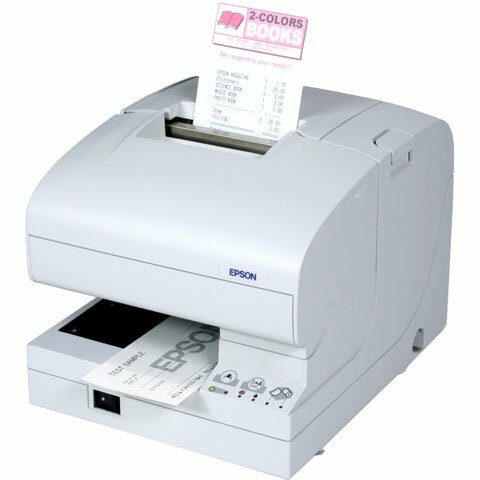 The Epson TM-J7100 Multifunction Inkjet Printer was designed specifically for retail applications. With its ability to print high resolution logos and graphics, it's a great way to get marketing messages across. Features include 2-color receipt and slip printing at 14.7 ips, MICR reading, one-pass check printing, & the smallest footprint in its class. Ink Cartridge (Blue) for the TM-J7100 Series. 10 ribbon case. The Epson C31C488A8931 is also known as Epson POS Products	EPS-C31C488A8931	.